Do You Have Holes in Your Stored Winter Clothes? People are beginning to break out their winter clothing, which includes wool clothing. In some cases, there may be holes in some of the items that are caused by the small carpet beetles. 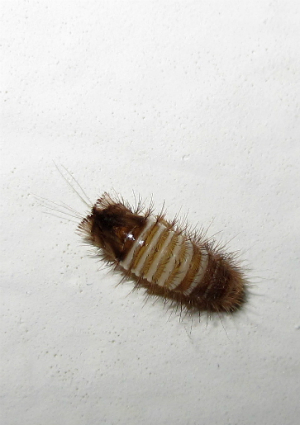 Carpet beetles will feed on and damage clothing, upholstery, and, yes, even carpeting. Carpet beetles are small, oval beetles about 3/16 of an inch in size, or about the size of the lead on the end of an unsharpened, number 2 pencil. These beetles vary in color from tan to grayish black. The larvae, which cause the most damage, look like small caterpillars with tufts of hair on their back end. These beetles are normally attracted to animal based products like wool, leather, and feathers. They may feed on synthetic fabrics if they are stained with food products or have body oils on them. Clothing that is worn and cleaned on a regular basis is not as susceptible to carpet beetle attacks as stored clothing, since washing and dry cleaning normally kill the beetles. Another method of eliminating infestations is to place infested clothing in an airtight container. Mothballs, which are sometimes used to repel beetles, should not be used anywhere people or pets may come into constant contact. Pesticide are labeled for carpet beetle control and should be applied to cracks and crevices in the infested area. If the infestation persists, then hiring a pest control operator is recommended. Do not apply pesticides to clothing. Many pesticides have a petroleum base and may stain fabrics they are sprayed on; so, make sure to read the label. You may be able to limit infestations by carefully examining any clothing or furniture that has been stored for any length of time. Also, storing clothing in airtight bags or containers will help prevent infestations. If you spot the beetles, wash or dry-clean the item immediately. A little prevention can go a long way in eliminating headaches later. • Gardening Myths- Fact, Fiction or Somewhere in-Between?